"Keft" redirects here. For the villages in Iran, see Keft, Iran. Qift (Arabic: قفط‎‎; Coptic: Ⲕⲉϥⲧ Keft or Kebto; Egyptian Gebtu; Ancient Greek: Κόπτος Coptos or Koptos; Roman Justinianopolis) is a small town in the Qena Governorate of Egypt about 43 km north of Luxor, on the east bank of the Nile. In ancient Egypt, Qift, known then as Gebtu, was an important center for administration, religion, and commerce, being the chief city of the fifth Upper Egyptian nome of Harawî (Two Hawks). From Qift and Qus, trading expeditions heading for the Red Sea and many mining expeditions into the Eastern Desert left the Nile Valley. Gebtu was at the starting-point of the two great caravan routes leading to the coast of the Red Sea, the one toward the port Tââou (Myoshormos or Myos Hormos), the other more southerly, toward the port of Shashirît (Berenice). Under the native pharaohs, the whole trade of southern Egypt with the Red Sea passed over these two roads; under the Ptolemies as well as in Roman and Byzantine times, merchants followed the same roads for purposes of barter at the coasts of Zanzibar and in Southern Arabia, India, and the Far East. Gebtu was the most important religious center in the area. Its principal male deity was Min, a sky-god whose symbol was a thunderbolt. He became a male fertility deity, , and also was regarded as the male deity of the desert region to the east. His cult rose to prominence in the Middle Kingdom. At that time, he became associated with Horus as the deity, Min-Horus. Later, he was fused with Amen in the deity Min-Amen-ka-Mut-ef, as "Min-Amen-bull of his mother" (Hathor-Isis). Isis (Hathor-Isis) and her infant, Horus, were the deities connected with Gebtu, named Coptos during the Greco-Roman period, probably due to the reinterpretation of the Two Hawks of the Nome, Harawî, standard as Min and Horus. Gebtu, once politically important, especially under the eleventh dynasty, was overshadowed by Thebes. It recuperated its prominence under the Antonines; it was the base camp of Legio III Cyrenaica, or at least one of its subunits. It rebelled, but soon was captured in 292 by Diocletian after a long siege and almost destroyed, but soon recovered its former standing. In the 6th century, Qift was renamed Justinianopolis, like several other cities, after the Byzantine emperor Justinianus I. 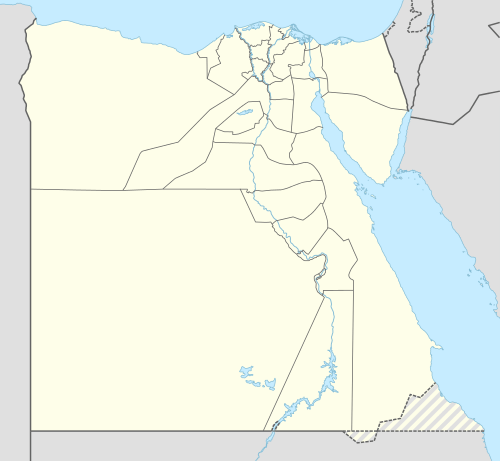 Under the Muslim caliphs and the sultans, Qift remained one of the chief cities of Upper Egypt. In 1176, its Christian inhabitants raised the standard of revolt against the Muslims, but were suppressed promptly by Al-Adil, brother of Saladin, who hanged nearly 3,000 rebel Copts on the trees around the city. In the 13th century, there still were numerous monasteries around the city. Qift was ruined in the 16th century by the Ottomans. Remains of three temple groups surrounded by an enclosure wall were located during the excavations of W. M. Flinders Petrie in 1893-1894, and later, by Raymond Weill and Adolphe Joseph Reinach in 1910-1911. Qift was the focus of an American archaeological project from 1987 to 1992 and an Australian one between 2000 and 2003. The undecorated northern temple of Min and Isis  dates to the Ptolemaic period. Earlier structures on the site date back to the Middle Kingdom, with significant work during the New Kingdom reign of Tuthmosis III. The temple was rebuilt during the Ptolemaic Period. The later work has been attributed to an official named Sennuu-shepsi on behalf of Ptolemy II Philadelphus (ruling from 281 BC to 246 BC). This northern temple has some later additions by Ptolemy IV Philopator ruling from 221-205 BC. He was the son of Ptolemy III and Berenice II of Egypt and was the fourth pharaoh of the Ptolemaic Egypt, when the decline of the Ptolemaic kingdom began. More additions were added by Julio-Claudian emperors of Rome, Caligula, and Nero. The second pylon still carries the dedication text of Nero, and the cartouche of Caligula appears on the north end of this structure. In the court of the temple a headdress of a statue of Arsinoe II, the wife of Ptolemy II Philadelphus, was found. A chapel from the Saite period stands in the court. The remains of this chapel of Osiris, erected by Amasis II of the 26th dynasty, also were found near the northern temple. 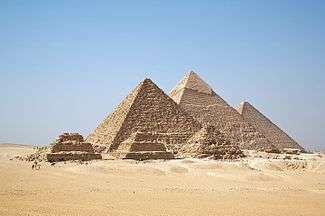 It was built by Ahmose-si-Neith. Scenes on the facade of the temple show the deified king Ptolemy I Soter leaving a palace, while other items such as a triad and a stela date to the time of Ramesses II. This temple stands on the site of earlier Ancient Egyptian temple structures. Foundation deposits point to a temple of Thutmose III of the 18th dynasty. Another temple belonged to Amenemhat I and his son, Senusret I, both of the 12th dynasty. Senusret I is shown receiving life from Bubastis and Nekhbet. Within this temple a decree from the 17th dynasty ruler Nubkheperre Intef was found by the East doorway. The decree describes how Nubkheperre Intef deposed a man named Teti. The middle temple dates back to the time of Thutmose III of the 18th dynasty. The temple was later rebuilt by Ptolemy II Philadelphus and restored by the Roman emperor Claudius. At the site of the later middle temple built during the Ptolemaic kingdom, blocks of an earlier structure by Senusret I and a gate of Thutmose III, with additions probably made by Osorkon II of the 22nd dynasty, were found. This later middle temple was built during the Ptolemaic kingdom by Ptolemy II Philadelphus, with minor additions by members of the Julio-Claudian dynasty of Rome, Caligula, Claudius, and Trajan. The foundations contained objects from the Old kingdom and the First Intermediate Period. Stelae were found depicting Pepi I and his mother Queen Iput before the god Min, two decrees and fragments of others by Pepi II. A First Intermediate Period decree regarding offerings to a statue of Pepi II was found. The stele mentions the overseer of the prophets named Idi. Three decrees of Neferkauhor, two of which were addressed to a Vizier and are now in the Cairo Museum. The southern temple was likely dedicated to Geb At the site of the southern temple, are the gates of Nectanebo II of the 30th dynasty, who was the last native king of Egypt. He was placed on the throne by a Spartan king and lost a conflict with the Persians, who then overtook Egypt. Other structures found at the site include a set of stelae, now known as the Coptos Decrees. These stelae date to the Sixth and Seventh Dynasties, with copies of royal decrees from the pharaohs concerning the temple and its personnel. The name by which the stelae are known reflects the much later Greek name for the city, Coptos or Koptos however. A chapel of Ptolemaic dynasty pharaoh Cleopatra VII and her son, Ptolemy XV Caesarion, has been found at the site as well. These rulers of Ancient Egypt for six hundred years were not native, but of Macedonian Greek origin (the Macedonians had begun the merging of Greek and Near Eastern culture known as the Hellenistic Culture under Alexander the Great). Without many changes, however, they adopted the culture and religious practices of the country they occupied. Cleopatra even learned the ancient Egyptian language, which never had been used by these rulers. The Greeks sought to find parallels to their own religious beliefs and would describe the Egyptian deities as related to their own. Built even later, after the conquest by the Romans in 30 AD, gates associated with the Roman emperors Caligula and Claudius are documented at the site. The Romans also continued the religious traditions of Ancient Egypt, adopting some completely, and drawing parallels (similar to the Greek rulers) for others. Northeast of Qift, at the modern village of El-Qala, the Roman emperor Claudius also built a small temple and dedicated it to Min, Isis, and Horus. The Horus name of the Roman emperor Tiberius (emperor 14-37 A.D.) is shown on two columns in the sanctuary. In the same sanctuary Claudius is shown before Isis. In the south chapel the emperor offers to Hathor, while on the exterior he is shown offering to the united emblems of Upper and Lower Egypt. The Christian city was still important enough to become a bishopric, suffragan of Ptolemais in the Late Roman province Thebais Secunda. Five bishops are known (Lequien, II, 607): Theodorus, a partisan of Meletius; Phoebammon in 431; Sabinus in 451; Vincent, author of the "Canonical Solutions", preserved in an Arabic translation and highly esteemed by the Copts; Moyses, who wrote the panegyric of Vincent. It faded under Islamic rule, no later then the Ottoman ruin of the city. The diocese was nominally restored as a Latin Catholic titular bishopric, initially under the name Coptos, which was changed in 1925 to Coptus. Luis Alfredo Carvajal Rosales (1955.07.28 – 1967.02.17). 1 2 3 4 Spencer, Margaret Murray, Egyptian Temples, Routledge, 2013, retrieved via Google Books. 1 2 3 4 5 6 7 8 9 10 11 12 13 14 15 Porter, Bertha and Moss, Rosalind. Topographical Bibliography of Ancient Egyptian Hieroglyphic Texts, Reliefs and Paintings, V Upper Egypt: Sites (Volume 5). Griffith Institute. 2004. Wikimedia Commons has media related to Qift.